As we leave the rain-soaked Willow City Loop behind, our thoughts turn to the next stop on our itinerary. 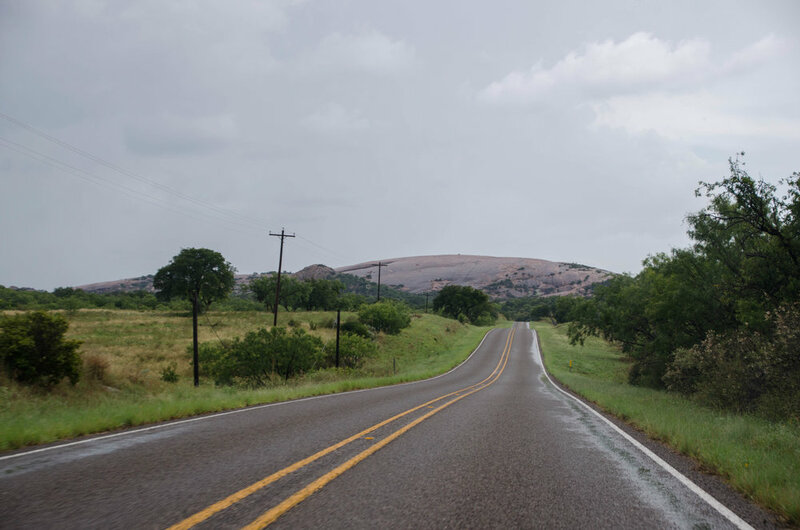 We’ve only driven a few miles when we see the sign for Enchanted Rock State Natural Area. Tim immediately, and predictably, asks “Do you want to go?” During the planning phase of this trip, I had discarded the idea of stopping at Enchanted Rock. It’s certainly a place I want to see, but in the middle of summer, I find nothing enticing about climbing a bare rock in the blazing sun. I answer him with a determined “No”. He’s the impulsive adventurer and I’m the planner, so he knows that sometimes, I just need to mull things over a little. In light of this, he repeats the question a few more times. 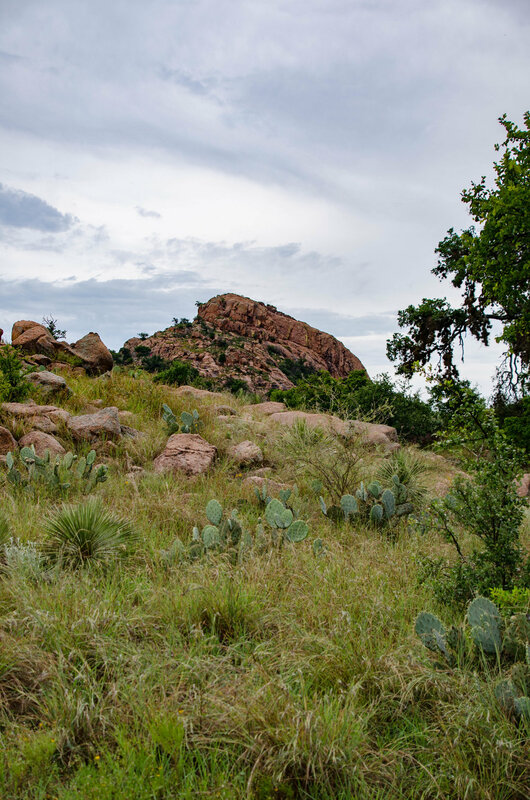 When he says “The temperature has dropped to the mid 70s”, Enchanted Rock suddenly seems very promising. 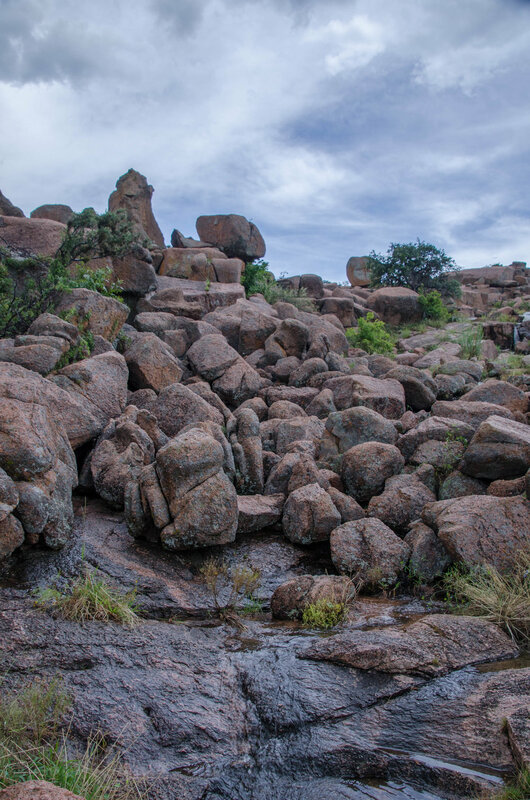 Enchanted Rock is a pink granite batholith. 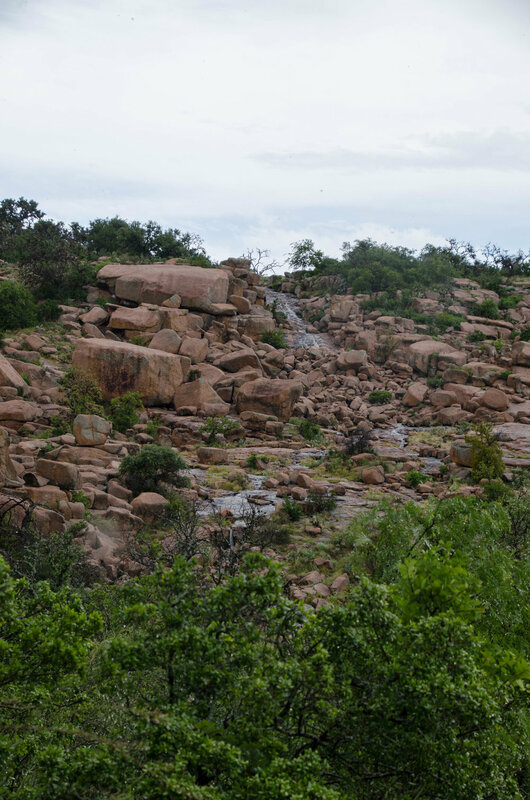 The rock that forms a batholith, plutonic rock, is shaped by magma crystalizing near the base of the planet’s crust. As the crystalizing magma is being pushed toward the surface, it cools and solidifies . Plutons don’t normally break the surface, but rather remain underground. When they do occasionally break through the surface, their crystal structures will continue to expand, which places a great deal of tension on the rock’s outer layer. Over millions of years, this rock will shatter, slide apart, and eventually expose the dome below. 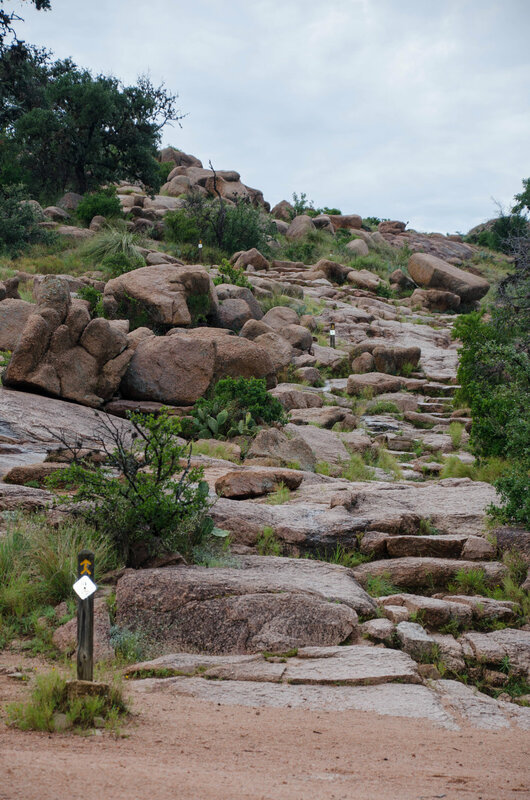 The State Natural Area has put up signs notifying visitors that the trail to the top of Enchanted Rock has been closed due to the recent rain. We had no thought of attempting the one hour hike to the summit anyway, so instead we head for the loop trail that takes visitors around the dome. As we walk, the sound of trickling water is all around us, and we look up to see areas where temporary miniature waterfalls are created. The summit doesn’t really look to be very far away and doesn’t seem particularly steep. I suspect the most challenging part of the hike is the return trip. Leaning into the ascent always feels more comfortable than leaning back during the descent, especially over bare rock. The hike to the top is only 0.81 miles long, but the 425 feet of elevation must make for some impressive views. 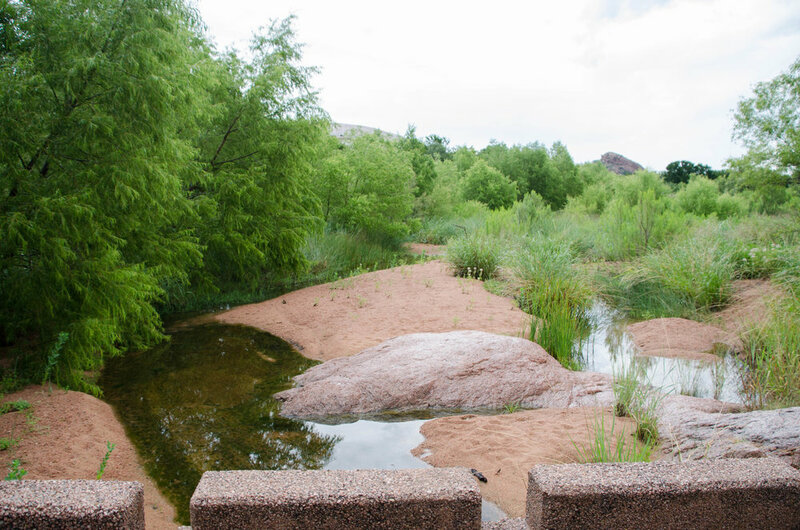 The park has 11 miles of hiking trails, so there’s plenty of room to spread out. With an annual visitor count of around 250,000 people a year, that's a good thing. Whereas I expected that encountering rain at the state park might be somewhat rare, it looks like the park receives around 30 inches of rain a year. The rain is apparently not as rare as I thought, but the very comfortable temperature is. Scanning the landscape of the Hill Country, it would be easy for anyone to assume that it’s generally dry. 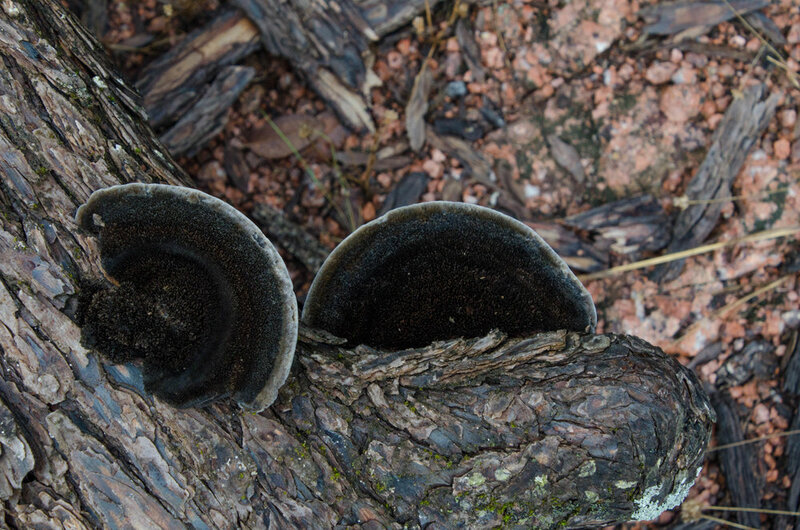 The soil layer is so thin that the underlying limestone often lies exposed. It’s a surprise then, as you focus on the plant life, to realize that there’s a great deal more in the way of variety than you might expect. For anyone not from this area, the prevalence of Prickly Pear cacti is one of the first things you notice. They look so decorative and exotic, especially if you’re not native to this area. The cacti seem to enjoy long term snuggles with a variety of wildflowers and grasses, so there’s no lack of photo worthy images. 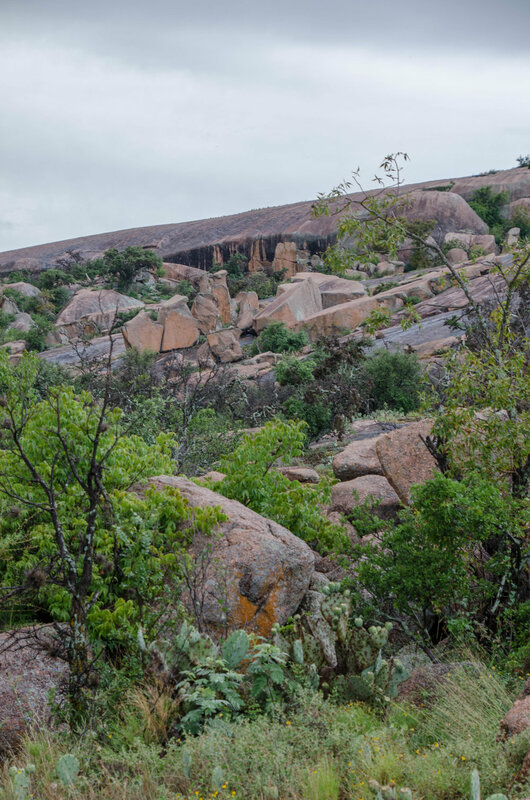 Our stay at Enchanted Rock is regrettably brief, but I’m so happy we chose to take the detour! During a trip, it’s often the unexpected adventures that leave the largest impression. 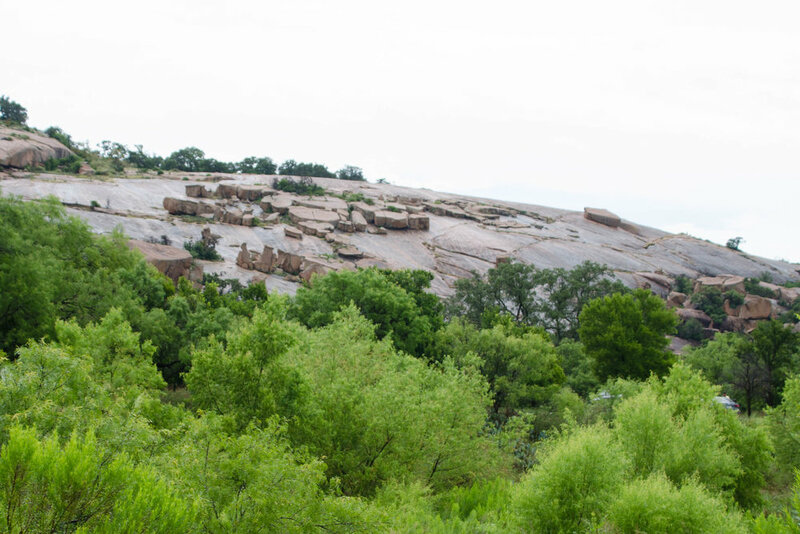 After all these years, I’ve seen Enchanted Rock. As we get back on the road, heading north, we have several more stops lined up. There will be a small town to explore, more Hill Country scenery, including some water views, and then a much anticipated respite from the sun.